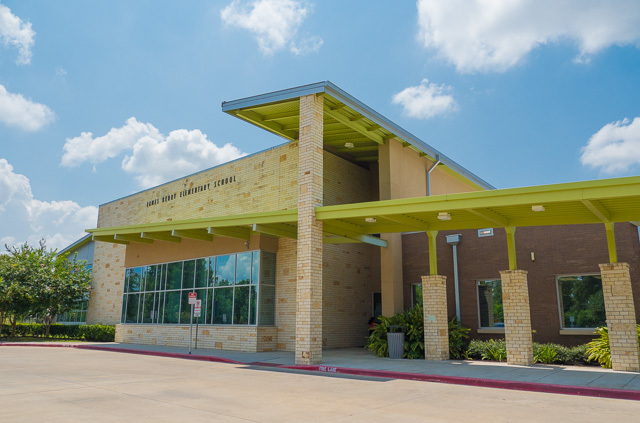 HISD is home to several magnet schools, what this means is certain schools in the district have a specialized curriculum pertaining to a subject. Some magnet schools focus on fine arts, some STEM and still others, environmental science. 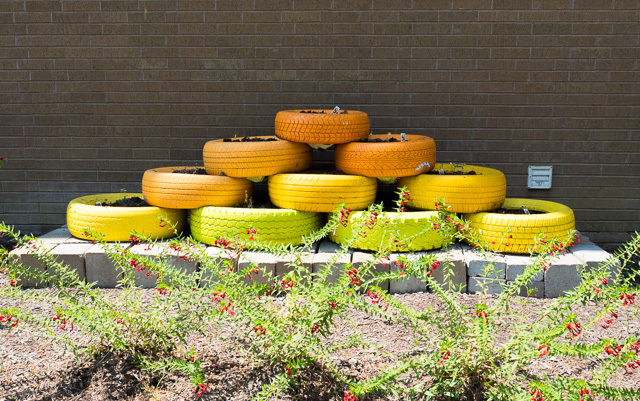 Recently Bioplanet toured one of HISD’s environment science schools. 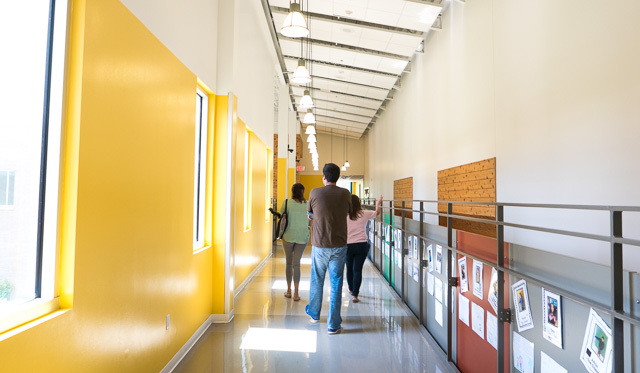 The group was shown around the campus and learned about how the building became silver LEED certified, which is no small task, and the importance environmental science plays at this school. This state of the art school looks brand new, despite being six years old. All around the perimeter of the school, large canisters have been attached to drainage pipes to catch and reuse rainwater. The main office of the school features a desk and waiting bench made out of sunflower seed shells. The building itself was made from 80% recycled material from the previous structure and has lessons built right into it, such as a portion of the wall where the insulation is exposed and students can see what it looks like through a glass pane. The entire building is also outfitted with windows that allow natural light in, but keep the heat out. They make for a very bright and welcoming atmosphere. The paints used are low in chemicals and allow for better air quality. 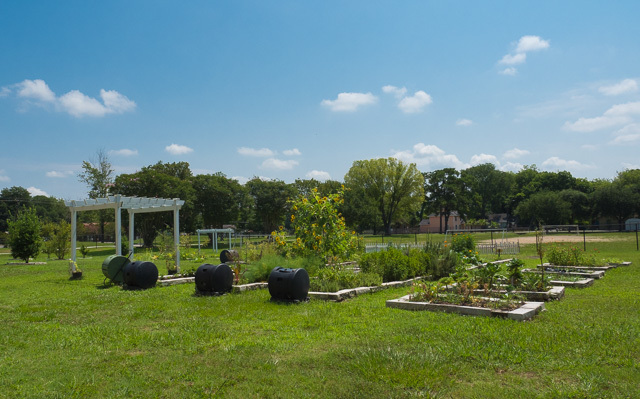 Berry Elementary also provides hands on learning for their students by utilizing a school garden. First and second grade students tend to the garden, and whatever is harvested is even cooked by the students. After touring the classrooms, labs, pods, cafeteria and school gardens, the group sat down to talk about what is being used in the lunch room. After all the measures taken to be green, it seems a shame that Berry is still using foam trays to serve food. A science teacher, met the group and spoke about how she and other teachers at the school incorporate the environment in as many lessons as possible, including tending to the school garden, in-classroom composting and teaching class outside. With such an eco-friendly school and curriculum it seems unfortunate that students are still eating off foam in the cafeteria. Though the kids separate trays from the food waste, there isn’t much information on what happens to the trays after separation, whether the foam is sent to be recycled or if it’s simply thrown away. Recycling foam is quite costly and can actually be harmful for the environment as well. 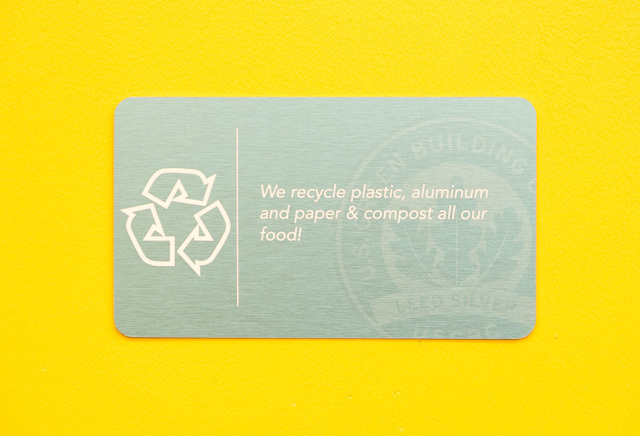 Switching to compostable plates would not only cut down cleaning time in the cafeteria as students would simply dispose of their food scraps and trays in one pile, but it would also serve as a lesson of decomposition. The science teacher mentioned it would be a great experiment to show the kids how a tray or plate made from sugar pulp can be decomposed back into fertilizer for their garden. Using the composted plates in the school garden could also help cut down on fertilizer costs and help cover the cost of the switch. Seeing as these magnet schools are the leader for environmental initiatives, the idea of switching Berry to compostable plates and trying it out at this location was mentioned, and if done so, the results could be replicated at other schools if desired. The students at Berry seem to have a passion for the world around them and enjoy learning new ways to protect our precious resources. They have made small changes to make big impacts such as installing sensor lights that only turn on when there are people in the room. A switch to compostable plates might be a good choice for the school’s next healthy alternative.